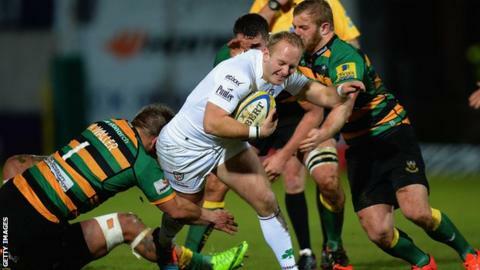 Premiership leaders Northampton Saints edged out London Irish but the struggling visitors battled to a losing bonus point at Franklin's Gardens. Ken Pisi collected Stephen Myler's kick to put Saints ahead after 28 scoreless minutes, but a Shane Geraghty penalty closed the gap to four points. With Exiles forward Tom Guest in the sin-bin, Sam Dickinson was driven over for the decisive Northampton try. Two more Geraghty kicks sandwiched a Myler penalty to complete the scoring. Director of rugby Jim Mallinder watched his Northampton side make a host of mistakes throughout and the home pack only just held out a last-minute line-out drive from the visitors. The hosts had already squandered a try-scoring opportunity when Tom Stephenson was adjudged to have dropped the ball on the line by the television match official, but a minute later he was back in action when Ken Pisi dived to ground a cross-field kick from Myler, who duly converted to make it 7-0. Dickinson missed the whole of his first season at the Saints in 2012-13 after suffering a broken arm in his final game for Rotherham Titans. Geraghty reduced the arrears with his first penalty and then missed one on the stroke of half-time either side of opposing props Salesi Ma'afu and Tom Court being shown yellow cards. Ma'afu was sent to the bin for holding onto Court's leg, while the former Ireland loose-head was carded for retaliating with a stamp. Within four minutes of both sides returning to 15 men after the break, Guest was yellow carded for coming into the side of a Saints maul heading towards the try-line. At the second attempt the hosts did drive over through Dickinson, although Myler missed the conversion before Geraghty landed a long-range penalty to make it 12-6. Myler then increased the advantage to nine points with another kick from the tee but Geraghty replied with another penalty for Irish. A series of penalties set up a five-metre line-out drive for the Exiles but Saints managed to hold firm and push it into touch just short of the try-line before the final whistle. Northampton are now five points clear at the top of the Premiership table, but second-placed Bath face Saracens on Sunday, while Irish are a point above Newcastle in 10th. Northampton Saints director of rugby Jim Mallinder: "The positive is that we won and are still top of the league, but the downside is we didn't play very well. "We created a lot of chances, a lot of our options were good, but our accuracy was terrible. "London Irish slowed the game down and got stuck into us, it was a gritty away performance by them and in the end we were lucky to win." "We need to have a look at this performance, and we need to get our basics right. A lot of that is just playing to space, being able to pass and catch under pressure - you don't need extra sessions to do that." London Irish head coach Glenn Delaney said: "We are pretty disappointed we didn't win. We knocked it on over the line and tight games come down to those sorts of things. "To be in the contest against the champions in their back yard was a great effort from our lads, we defended really, really well and created pressure. "We have done well, but we can't be satisfied, we had the winning of the game in our hands, but we didn't execute it." Northampton Saints: Wilson; K. Pisi, G. Pisi, Stephenson, Elliott; Myler, Fotuali'i; A. Waller, Haywood, Ma'afu, Manoa, Day, Clark, Dowson (capt), Dickinson. Replacements: Williams, E. Waller, Denman, Craig, Harrison, Dickson, Olver, Tuala. London Irish: Fenby; Ojo, Mulchrone, Sheridan, Fowlie; Geraghty, Steele; Court, Paice, Aulika, Skivington (capt), Sinclair, Treviranus, Gilsenan, Guest. Replacements: Stevens, Halavatau, Palframan, Cox, Narraway, O'Leary, Brophy-Clews, Lewington.